Fr. Zynoviy Kovalyk was born on 18 August 1903 in the village of Ivachiv Horishniy near Ternopil to a poor peasant family. Before becoming a monk he worked as a primary school teacher in his village. He had a strong character and never compromised his faith. The dream of Zynoviy's childhood was to become a priest. Having discovered his vocation to consecrated life, Zynoviy Kovalyk joined the Redemptorists. He professed vows as a Redemptorist on 28 August 1926. Shortly after professing his vows, Zynoviy was sent to Belgium for philosophical and Theological studies. After his return to Ukraine, on 9 August 1932 Zynoviy Kovalyk was ordained a priest. On 4 September 1932 Fr. Kovalyk celebrated his first Liturgy in his home village of Ivachiv. The little icons commemorating his ordination bore the following inscription: "O Jesus, receive me [as a sacrifice] together with the Holy Sacrifice of Thy Flesh and Blood. Receive it for the Holy Church, for my Congregation and for my Motherland". Christ received these words as a most pure offering. Little did Fr. Kovalyk know that those words were prophetic, and that soon - in just nine years - they would come true in his martyrdom. After his ordination Fr. Kovalyk departed, together with bishop Mykolay Charnetskyi, to the Volhyn region to serve the cause of reconciliation with Orthodox Ukrainians. The young priest was a true joy to his confreres. Fr. Kovalyk had a good sense of humour, beautiful voice and clear diction. He was a great singer and truly a preacher with a "golden mouth". His apostolic devotion attracted thousands of people. Fr. Kovalyk loved the Mother of God with all his heart, and always displayed sincere piety towards her. These qualities of Fr. Kovalyk brought him great success in his missionary activities. Having spent several years working in the Volhyn region, Fr. Kovalyk moved to Stanislaviv (now Ivano-Frankivsk) to conduct missions there, both in town and in suburban villages. Immediately before the Soviet invasion of 1939 he moved to Lviv, to the Redemptorist monastery in Zyblykevycha (now Ivana Franka) street, and took charge as economo of the monastery. The courageous priest continued preaching the Word of God even after the Soviet invasion had started. An important field of Fr. Kovalyk's work was hearing confessions, and it is in this field that he had particular success: he was always approached by a great number of people seeking spiritual support. While most of the Galician Ukrainians were overpowered by terror, Fr. Zynoviy displayed admirable courage. Most of the preachers were extremely cautious in their sermons. They tried to avoid the burning issues of the day and concentrated on exhorting people to be faithful to God. Fr. Kovalyk, on the contrary, was never afraid to openly condemn the atheistic customs introduced by the Soviet regime. His sermons had a great impact on the audience, but at the same time constituted no small danger for the preacher. When advised by his friends of the possible danger resulting from such manner of preaching, Fr. Kovalyk answered: "I will receive death gladly if such be God's will, but I shall never compromise my conscience as a preacher". The last great sermon by Fr. Kovalyk took place in Ternopil on 28 August 1940 on the occasion of the feast of the Dormition of the Mother of God. That day, Fr. Kovalyk had some ten thousand faithful in his audience. His old dream of martyrdom was to come true in just a few months. On the night of 20-21 December 1940 the agents of the Soviet secret police entered the Redemptorist monastery to arrest Fr. Kovalyk for his sermons on the Novena of the Immaculate Conception of the Mother of God, which he had been delivering in the monastery's church. Before leaving his confreres, Fr. Kovalyk asked his superior Fr. De Vocht for the last blessing and absolution. Although the Redemptorists had long tried to find out about their arrested confrere, it was only in April 1941 that they received information about Fr. Kovalyk being kept in prison in Zamarstynivska street (the so-called "Brygidky" prison). During his six months long imprisonment, Fr. Kovalyk underwent 28 painful interrogations; three times he was brought to other prisons and interrogated there. After one such interrogation, which was accompanied by especially cruel tortures, Fr. Kovalyk fell seriously ill due to considerable loss of blood. While in prison, Fr. Kovalyk continued his apostolic work. He shared a tiny (4,20 by 3,50 metres) and unfurnished cell with 32 other inmates. Fr. Kovalyk together with the prisoners went through a third of the rosary on weekdays and through the whole rosary on Sundays. In addition, Fr. Kovalyk conducted liturgical prayers; in May he organized prayers to the Mother of God, and on the feast of Epiphany he treated the inmates to the liturgical consecration of water. Apart from prayers, Fr. Kovalyk heard confessions, conducted spiritual exercises and catechism, and consoled the inmates by narrating - in his peculiar humorous manner - various religious stories. No wonder that the prisoners - people in the greatest need of hope and consolation - truly loved Fr. Kovalyk for his apostolic character. In 1941, when German troops started their offensive, the prison keepers, eager to flee but not able to take the prisoners along, started shooting the inmates. However, it was not enough for them just to shoot Fr. Kovalyk: reminding him of his sermons about the crucified Christ, they nailed Fr. Kovalyk to the prison wall in full view of his fellow prisoners. When German troops entered Lviv, they immediately opened the prisons to clean up the piles of corpses that had already started to decay. The people rushed to the prisons hoping to find their relatives. As the witnesses relate, the most horrible sight was that of a priest crucified upon the prison wall, his abdomen cut open and a dead human foetus pushed into the cut. To characterize Fr. Zynoviy Kovalyk, we can rightfully use the words from the vespers of Martyrs regarding the glorious and invincible warrior, who armed himself with the Cross, defeated the foe, and received the crown of victory from the only Victor and Ruler who reigns forever. The blessed martyrdom of Fr. Zynoviy Kovalyk can serve as a graphic representation of the following words from Scripture: "The souls of the righteous are in the hand of God, and the suffering shall not meet them … For although the suffering has met them in the eyes of men, their hope is filled with immortality; having suffered a little, they will experience great blessings, for God has tried them and found them worthy of Him"(Wisdom 3,1.4-5). Taking into account the testimonies of Fr. Zynoviy Kovalyk's virtuous life, and particularly his endurance, courage and faithfulness to the Christ's Church during the period of persecution, the beatification process was started on the occasion of the Jubilee Year. On 2 March 2001 the process was completed on the level of eparchy, and the case was handed over to the Apostolic See. On 6 April 2001 the theological committee recognized the fact of Fr. Kovalyk's martyrdom; on 23 April his martyrdom was verified by the Assembly of Cardinals, and on 24 April 2001 Most Holy Father John Paul II signed a decree of beatification of Fr. 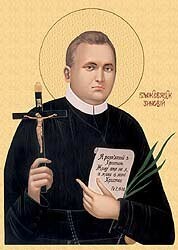 Zynoviy Kovalyk, a blessed martyr of Christian faith.